Protect the environment and the privacy of your project. When dealing with environmentally sensitive work sites, it's imperitive to keep hazardous emissions contained. Mahaffey's moveable, scalable Vapor Containment Structures (VCS) help keep potentially volatile gases and chemicals from finding their way into the atmosphere and surrounding community while keeping the curious public out of the work site. 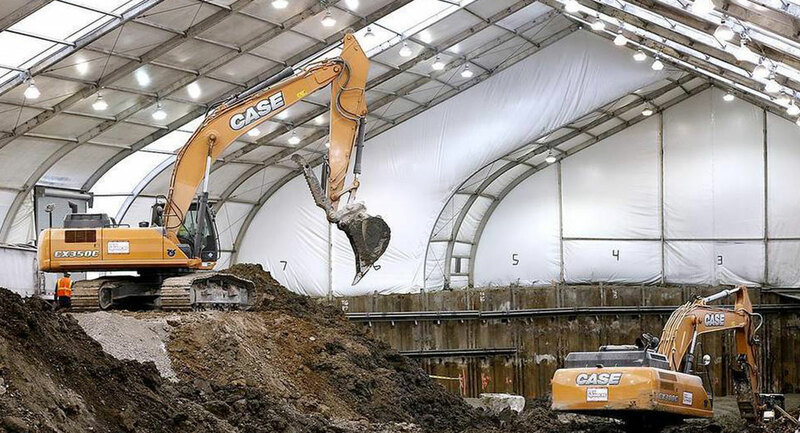 Mahaffey environmental enclosures can be used for volatile containment, decontamination tents, negative pressure and detoxification facilities and site security during environmental cleanup and soil remediation efforts. By creating negative air pressure inside the VCS, odors and vapors are completely contained, while air scrubbers can fully cleanse the interior air. Perhaps most valuable, Mahaffey VCS solutions can be easily moved during the project, enabling nearly continuous work flow. Mahaffey's modular designs allow you to tailor the size of your structure to suit your project. Mahaffey VCS solutions offer a wide variety of setup options from air-filtration systems to roll-up doors for heavy machinery. Mahaffey structures can be relocated at any time to keep things moving on your project.